So far, 10 companies have tapped the primary markets this year. Together they have raised `6,743.69 crore, as per Prime Database. Mumbai: The queue of companies looking to go public is growing longer, with 8-10 firms preparing to launch their initial public offerings (IPO) in the next two months, said four people with direct knowledge of the matter. Prospects of a strong monsoon season, which bodes well for the economy and markets, have encouraged companies to speed-up work on IPOs, the four said on condition of anonymity as work on launching the IPOs is underway. Companies looking to go public include RBL Bank Ltd, Larsen and Toubro Infotech Ltd, GVR Infra Projects Ltd, Quess Corp. Ltd, Sandhar Technologies Ltd, GNA Axles Ltd, Centre For Sight Ltd and Advanced Enzyme Technologies Ltd. Together, these companies are set to raise equity capital worth ₹ 6,000 crore, as per estimates by Prime Database, a primary market tracker. “We are targeting a few IPO deals in the next 1-2 months. Monsoon is very crucial for the market and everything depends on that for the moment," said a top official at a domestic investment bank on condition of anonymity. India benchmark index Sensex has risen more than 6% in the last 11 sessions on hopes of an above-normal rainfall, while the latest quarterly corporate earnings showed improvement and India’s economy clocked better-than-expected growth for the March quarter as well as 2015-16. Private weather forecasting company Skymet Weather Services Pvt. Ltd last week said it expected showers in the June-September season to come in at 109% of the long-term average of about 89cm (35 inches). This is higher than its earlier forecast of 105% in April as well as 106% by state-run India Meteorological Department (IMD). Mint reported on 2 June that Mahanagar Gas Ltd is likely to launch a share sale in the third week of June, with 20-22 June as the likely date. Existing shareholders—GAIL (India) Ltd and Royal Dutch Shell Plc—will sell 12.5% stake each and raise a total of about ₹ 1,200 crore. Mahanagar Gas is the sole authorized distributor of compressed natural gas (CNG) and piped natural gas (PNG) in Mumbai, its adjoining areas, and Raigad district in Maharashtra. CNG is used in motor vehicles and PNG for household, commercial and industrial use. Scheduled commercial bank RBL Bank Ltd intends to launch its offer in July, said two people familiar with the matter. The bank is looking to raise about ₹ 1,500 crore after meeting all regulatory and statutory guidelines. RBL Bank received a conditional approval from capital markets regulator Securities and Exchange Board of India (Sebi) for the IPO last month. Business Standard reported on 1 June that RBL Bank settled a securities market-related violation with Sebi under the consent mechanism. RBL Bank paid ₹ 47.6 lakh as the part of the consent terms to Sebi and also highlighted an exit opportunity to its investors. The Sebi settlement order was passed on 30 May. The IPO was kept in abeyance owing to violations of the Companies Act. 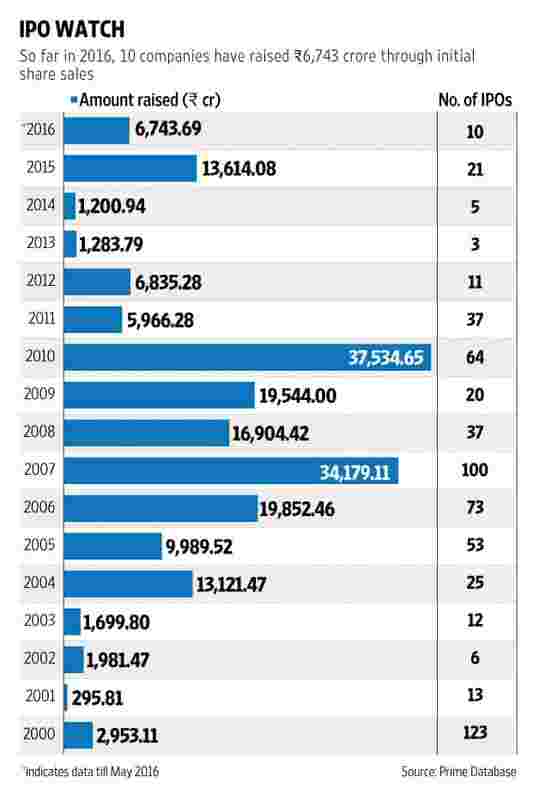 The previous board had allotted shares via rights issues to 2,591 investors in February 2003—far higher than the 200 investors stipulated under law. RBL Bank will become the first bank to list on stock exchanges in nearly six years. In December 2010, Punjab and Sind Bank launched its IPO to raise around ₹ 480 crore. IT services firm L&T Infotech Ltd is targeting its share sale by mid-to-late July, said one person with direct knowledge of the development. The subsidiary of Larsen and Toubro Ltd (L&T) is looking to sell shares worth ₹ 1,400 crore. The company was earlier looking to raise up to ₹ 2,000 crore but a 20% reduction in issue size prompted the company to withdraw its earlier proposal with Sebi and file a new application. Quess Corp., a business services provider owned by Thomas Cook (India) Ltd, is also looking to launch its IPO in early July. The proposed IPO will see the firm raise ₹ 400 crore. Quess is an integrated business services provider, offering various services such as recruitment, temporary staffing, technology staffing, IT products and solutions, among others. The company plans to use the IPO proceeds for repayment of debt, funding capital expenditure and working capital requirements as well as for acquisitions and other strategic initiatives. Emails to companies on Monday regarding their IPO decisions did not yield any response at the time of the story being published. “We’re seeing companies with 3-4 meaningful-sized deals looking to hit the markets over the next couple of months. Moreover, many companies are preparing for IPOs and are looking to file their papers with Sebi in the next four-five months. While there will be volatility due to global factors, the IPO pipeline remains robust and in my view companies could potentially raise about ₹ 25,000-30,000 crore by April 2017," said Subhrajit Roy, executive director, equity capital markets (origination) at Kotak Mahindra Capital Co. Ltd. So far, 10 firms have tapped the primary markets in 2016 so far. Together they have raised ₹ 6,743.69 crore, according to Prime Database. In 2015, 21 firms raised almost ₹ 13,600 crore through the IPO route—the best in five years, data showed.